Turns out HBO isn’t going to leave Garret Dillahunt twisting in the wind over those Deadwood movie tweets—according to /Film, the cable network released this official, albeit terse, statement regarding plans for a feature film. In reference to Garret Dillahunt’s tweet regarding the rumored Deadwood movie, there have only been very preliminary conversations. Dillahunt kicked the brief conversation off Wednesday night with a tweet about the “credible rumors” he’s heard. Then, in a move from Ron Perlman’s playbook, Dillahunt rallied fans with a prayer hashtag and the acknowledgment of a film based on a different (and lesser) HBO series. 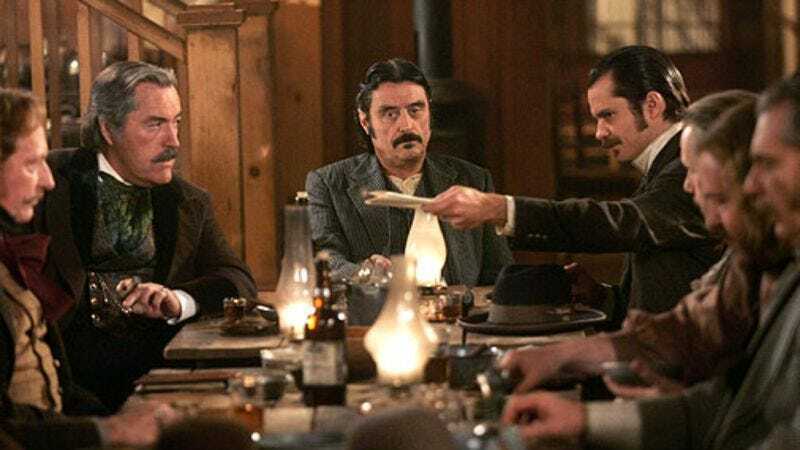 HBO didn’t give the most heartening response, but there are some encouraging factors to consider—former Deadwood regulars Ian McShane and Timothy Olyphant are mostly free these days to take their fictional feud to the big screen. And when Deadwood was canceled in 2006, there was talk of doing a couple of two-hour movies, so creator David Milch might get his chance to wrap up his series after all.